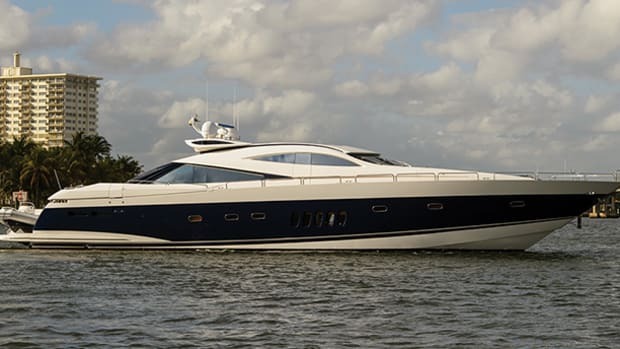 The Exumas are the ideal setting for a few days of bliss aboard a 116-foot Sunseeker. A cruise in the Exumas proves that when it comes to the Sunseeker 116 Lost Boys there is more than meets the eye. The 365 or so Exuma cays in the Bahamas span some 90 miles from the north of Beacon Cay southeasterly to Great and Little Exuma. A veritable overload of the senses, the crystal clear water, beautiful anchorages and myriad cruising opportunities are extraordinary. 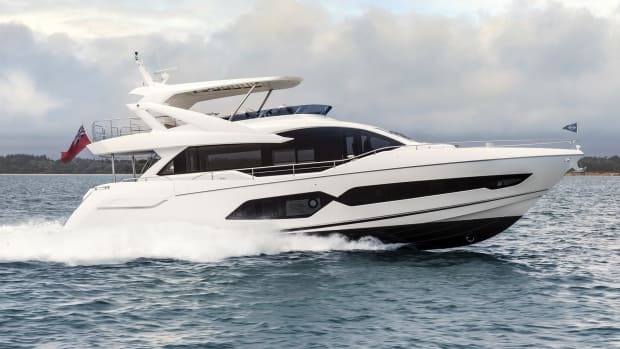 So when Bryan Jones, marketing manager of Sunseeker called with an invitation to meet a new Sunseeker 116 named Lost Boys in Staniel Cay, the midway hub for Exuma cruising, and spend a couple of days aboard, I was all in. 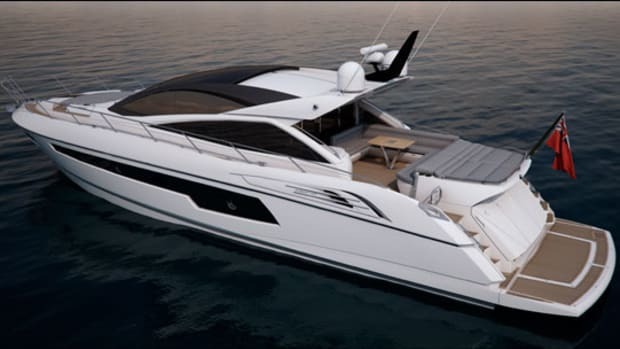 According to Jones, the 116 is based on the popular Sunseeker 115 Sport Yacht with its bespoke engineering pedigree and deep-V running surface. A new superstructure and other modifications add to the interior accommodations, notably an increase in exterior and entertainment space. Flying into the Exumas, I was to meet Lost Boys anchored just off Staniel Cay. Surveying the waters below from on high, I spotted her in the anchorage; her snow white angular hull and superstructure stood out amongst a collection of traditionally designed yachts, some larger, some smaller. 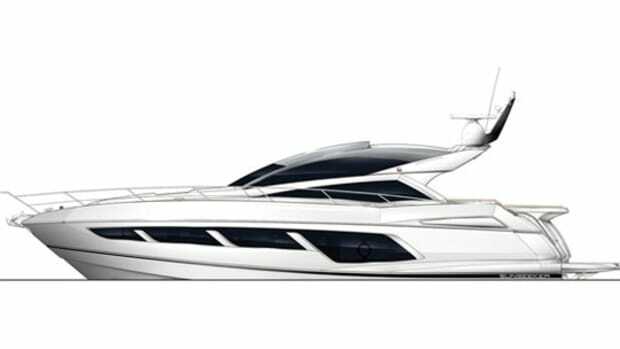 Sunseeker’s styling is eye-catching to be sure—accented with design lines, sculpted fiberglass and window glazing and gleaming stainless. She may have been on the hook, sharing the sandy bottom with the others, but she was only a hitch away from getting the party started. 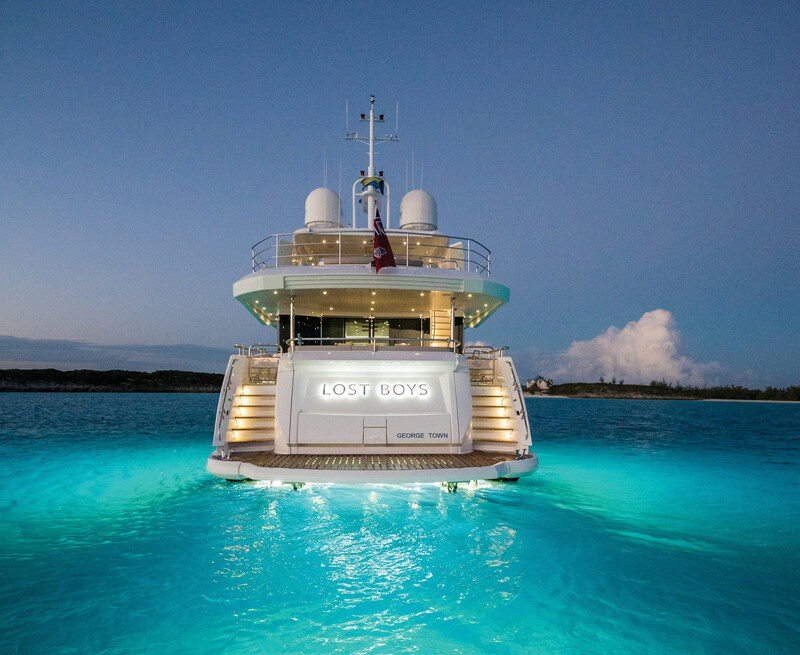 Arriving at Lost Boys after a short hop from the Staniel Cay Yacht Club aboard the yacht’s Yanmar-powered Williams Tender, Jones explained a full itinerary of events that would help establish a baseline for the owner who would be chartering the yacht. Staniel Cay was chosen because of its convenient location by air and the variety of family activities available in the surrounding waters. 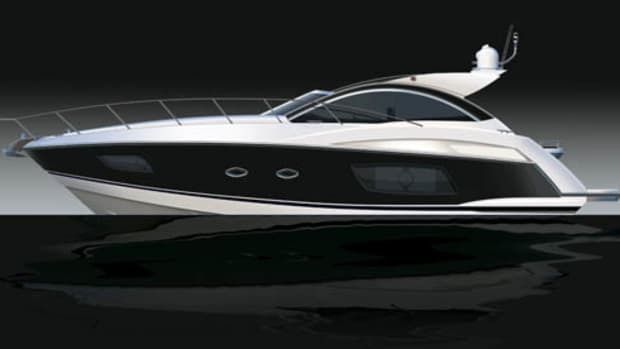 Boarding the yacht from the swim platform, the open garage door beckoned with watertoys—but they would have to wait until later in the day. Our first appointment after stowing our gear was a brisk tender ride to Big Major Spot where the infamous swimming pigs greeted us, snorting with enthusiasm. These feral pigs include burly adults and adorable piglets that swim out in anticipation of being fed, which we did by tossing raw potatoes into their gaping maws. It’s safer to feed them in the water so they avoid ingesting white sand with their intake, but it’s a thrill and a treat to watch them in action. Next up on our nature adventure was the Bitter Guana Cay, a down island steam to the home of the Exuma Island iguanas. With a look that only a mother could love, these endangered creatures are actually beautiful in their rippled hide, scales and wobbling eyeballs. Although intimidating at first glance, they share an island friendliness and are unafraid of humans, especially ones bearing watermelon chunks that are best offered from wooden skewers. With the iguanas fed, our appetites were growing too—but Jones had one more stop for our group, this time at the grotto made famous by the James Bond movie Thunderball. Here, we swam underwater to reach the inner cavernous walls. I’m still trying to determine which was more enthralling, the raw awe of that hidden sanctum or the schools of small fish that swam beneath me. Note the size of the windows that allow blue views to mesmerize guests during breakfast. Back aboard Lost Boys, a hot shower on the swim platform rinsed away the morning’s salt and we retired to the after deck for an amazing lunch prepared by chef Sergio Marichales. 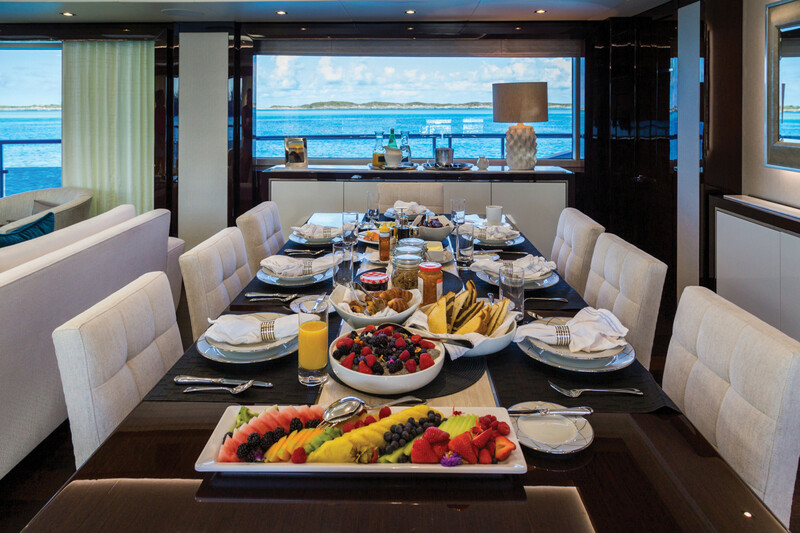 Culinary attractions and outstanding presentations are a major draw aboard luxury charter yachts and we weren’t disappointed. 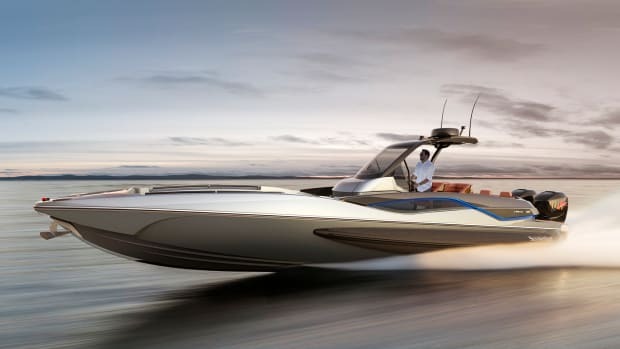 It was hard to leave the table for the afternoon of swimming and water sports, but the personal watercraft, the SeaBobs and the slide beckoned. Grabbing ahold of one of the PWCs, I circled the yacht a number of times, and its characteristics became more and more apparent. Every inch of its LOA is beautifully proportioned for practical use. Visually, the window lines add definition and complement the abundance of fiberglass, and the deck plans are exquisite not only in execution but also to maximize space, comfort, convenience and privacy. The five-stateroom layout includes a full-beam master suite on the main deck framed with natural lighting via full-height windows to further exploit the already visual spaciousness. A staircase amidships leads to a lobby and access to the other four staterooms. Two staterooms are fitted with double berths, while two have a pair of single berths that can convert to doubles to maximize flexibility for family and guests. Separate crew’s quarters include a lobby, a mess and dining area, and three staterooms, each with a head and shower. Sliding stainless-steel framed glass doors from the after deck lead into the salon. Accommodations are decided by the owner for their specifications but generally feature social areas including lounges, armchairs, a coffee table, stowage consoles, a 55-inch television screen that rises from the cabinetry and a comprehensive entertainment package. The wenge wood joinery aboard Lost Boys was deeply grained and its satin finish was flawless. A special touch was an owner-specified option for skylights in the ceiling; it dramatically enhanced natural lighting during the day. More obvious though was the volume of light and visibility afforded by the full-height side windows of the salon and the angular bulwarks outside the windows that allowed unobstructed views to the horizon while seated in climate-controlled comfort. Forward of the salon there is a formal dining area that seats ten. Flanking consoles house china and dinnerware. 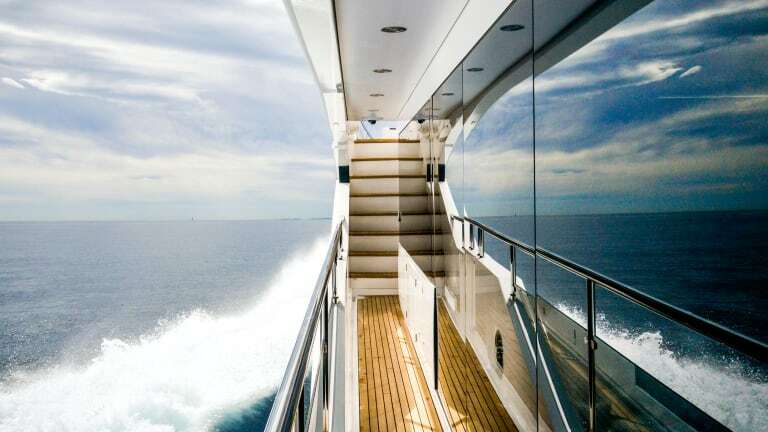 The well-equipped galley is nearby but a door isolates activity from filtering into the inner social areas. Just because the sun goes down doesn’t mean the fun is coming to an end. Flip on the underwater lights and watch as the sea comes to life. 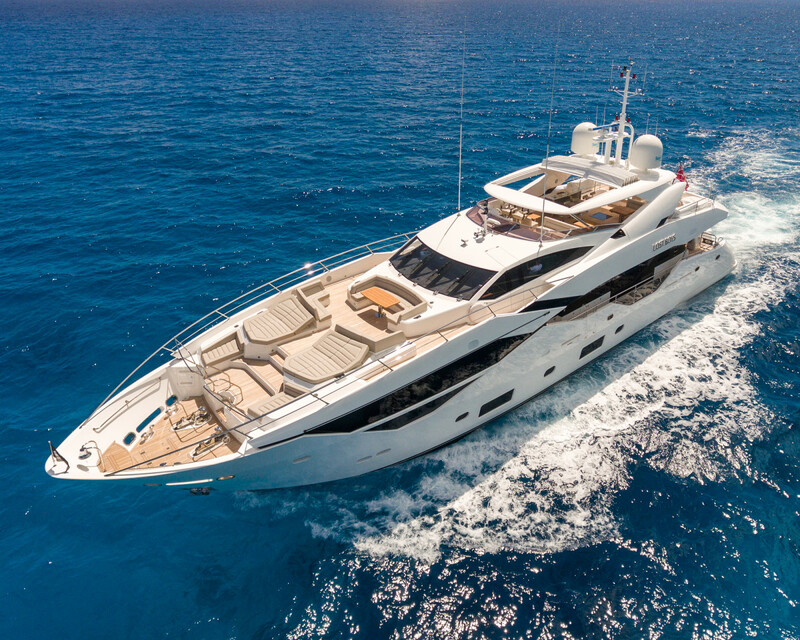 While the interior of the 116 is noteworthy for its formal fit and finish and accommodations, the exterior raises the bar on entertainment and fun. Wide teak-planked side decks lead toward the bow, which offers a second outside main deck dining area and aft-acing, L-shaped lounge seating. Double-width sun pads easily convert into forward-facing lounges. Still forward and down a couple steps is another pair of intimate seating areas port and starboard. If desired, some of this seating can be eliminated to make room for a hot tub. 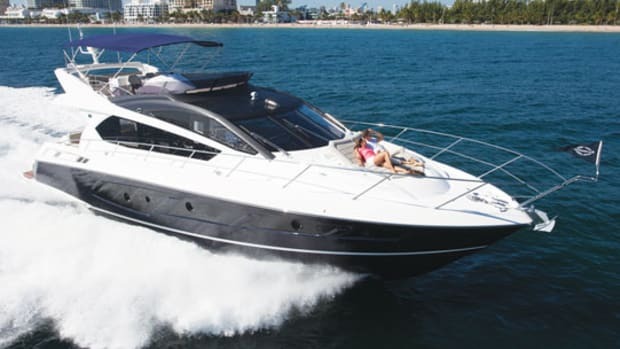 Or, the hot tub can go on the flybridge where the socializing theme ramps up unabated. 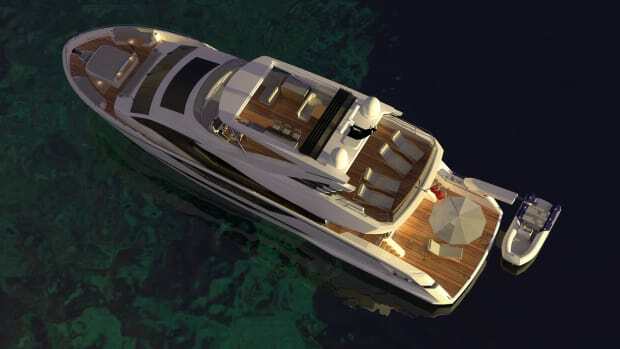 The flybridge is accessible from the main wheelhouse as well as from the noticeably wide aft cockpit stairs planked with teak. 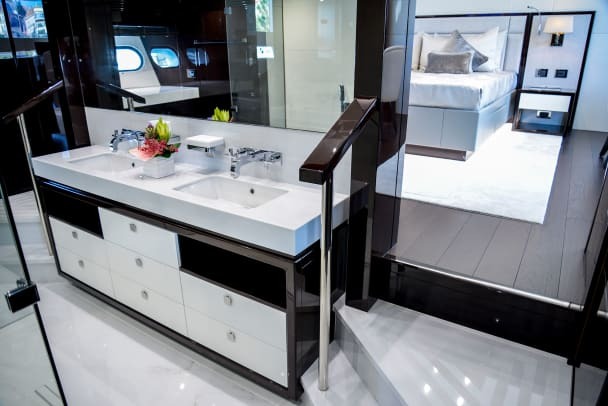 Sunseeker is thorough with its hardware, and the stainless-steel railing to the flybridge is no exception; it curves with the molded shape of the staircase for secure maneuverability. Multiple seating areas include lounges, a dining table and a wet bar with five bar stools, refrigerator, icemaker, a sink and an electric griddle for pancakes on the hook. Forward on the starboard side of the flybridge, the helm is protected with a stainless steel framed windscreen. Underway at the lower helm visibility is excellent and noise levels are minimal. A carbon fiber gullwing door opens electrically to access the side deck and wing controls. 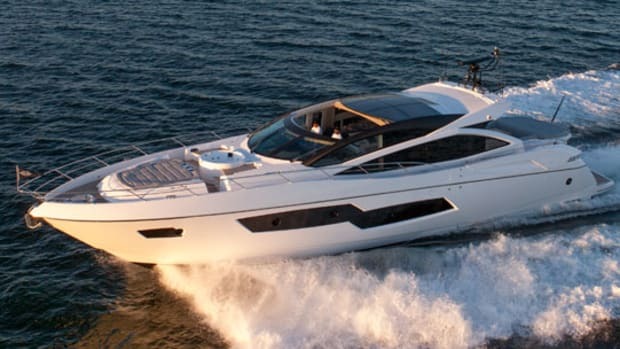 Powered with a pair of 2,640-hp MTU V16 Series 2000 M96L diesels, the 116 reportedly tops out at about 26 knots and has a 1,250 nautical mile range at 10 knots. When Jones brought us back to the Staniel Cay Yacht Club on the tender, the excitement on the docks was all about the local nurse sharks that gather around the concrete steps. The sharks slapped the water and tossed their tails for the onlookers watching in glee, but I turned my head and my eyes focused on the Sunseeker 116, looking beautiful anchored offshore in the fading light. She seemed born for the Bahamas.